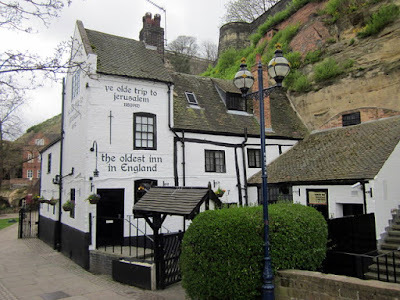 Ye Olde Trip to Jerusalem in Nottingham claims to be England's oldest pub, established in 1189AD. 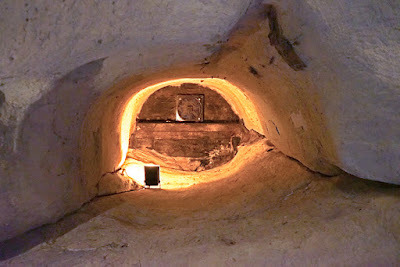 It's certainly an extraordinary one: built into Castle Rock, several of the rooms are carved out of the cliff. The current building dates back to the seventeenth century, and despite the obvious tourist appeal, it's a pleasant and atmospheric place for a drink. But is it that old? There is no evidence to prove it has been around that long, so the claim seems questionable. The caves here in the cliff were probably used by the castle's brewhouse at that time; but the first documentation of a pub is on a map of 1610. The name may appear to refer to the Crusades - and the Third Crusade departed in the year of its alleged foundation - but in 1760 the pub was known as the Pilgrim and the current name emerged about forty years later. So we have a centuries-old pub, but probably not England's oldest. However, the questionable myths don't stop there! Inside, the unique interior is decorated with some 'legendary' objects. 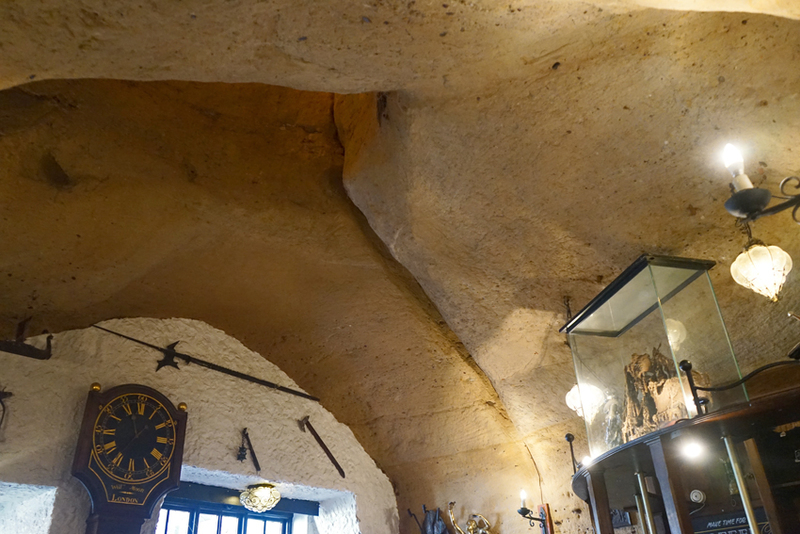 Most are in the Rock Lounge, once used as the malting room and with a sixty-foot chimney extending from the ceiling through the cliff above. 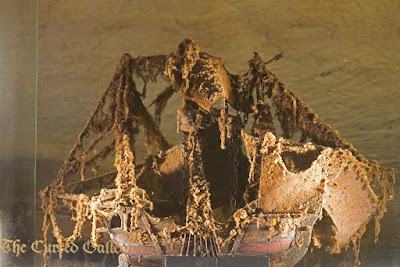 My favourite was the cursed galleon, encrusted in many years' dust. It is claimed that whoever cleans the ship will die a sudden death (a handy excuse for those of us who dislike housework). Indeed, it has allegedly claimed three lives, although the names and precise fates of those ill-fated cleaners are not given. Lest anyone be tempted to follow them and meet their doom, the galleon is now safely behind glass. Less remarkable in appearance is a chair on castors - but a sign tells its legend. Apparently, this is the ancient 'pregnancy chair'. Any woman who sat on it would soon become pregnant. Again, details are lacking (and the chair didn't look all that ancient). 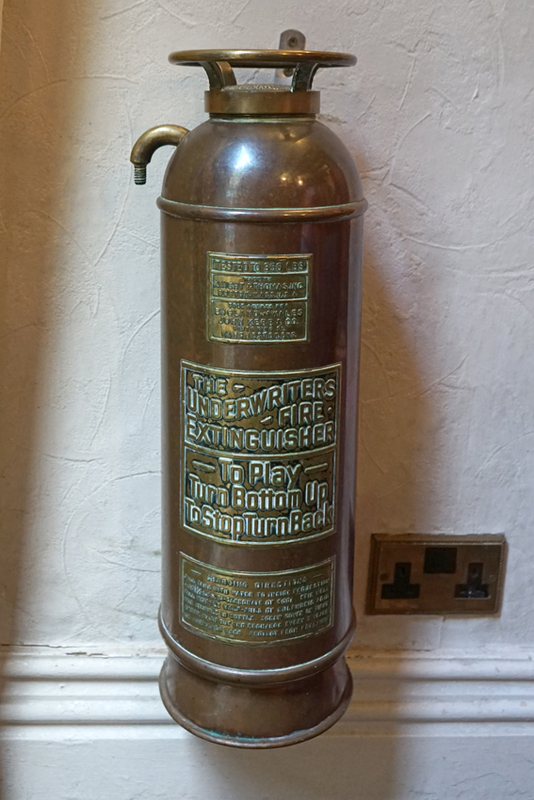 A fun story, but far more eye-catching for me was this fabulous, if unheralded, old fire extinguisher. The lowest plaque gives instructions for use: you fill the tank with water to indicated level, add .25lb of bicarbonate of soda, stir, then half-fill the bottle with sulphuric acid and replace the stopple. 'Recharge every 5 years.' These fire extinguishers worked by producing carbon dioxide when the bicarb and acid mixed (on this model, by turning the extinguisher upside-down) which forced out pressurised water. Ye Olde Trip to Jerusalem, then, is a lovely place of history and myth. There's more than enough appeal in its genuine history: a mediaeval brewhouse and maltings, a pub for over four centuries, an ancient building carved into rock. 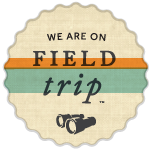 The questionable stories may not add to the academic interest of the place, but they do add to the atmosphere. Cheers! Exterior image by Roy Hughes, shared under Creative Commons licence (CC BY-SA 2.0).